It’s really been the key phrase over the last couple of years hasn’t it? Does it exist? If it does, is it really going to make a huge difference to our way of life? Do we care? These are huge questions to ask and the scope of opinions has already been enough to turn people off the subject. But what if we looked at a tiny little country set smack bang in the middle of the Pacific ocean? For the time being, lets ignore the political fights, the media wars and the constant reports. Let’s ignore all the eye catching headlines (except for mine of course) for the moment and take a look at Kiribati and a few things going on there. 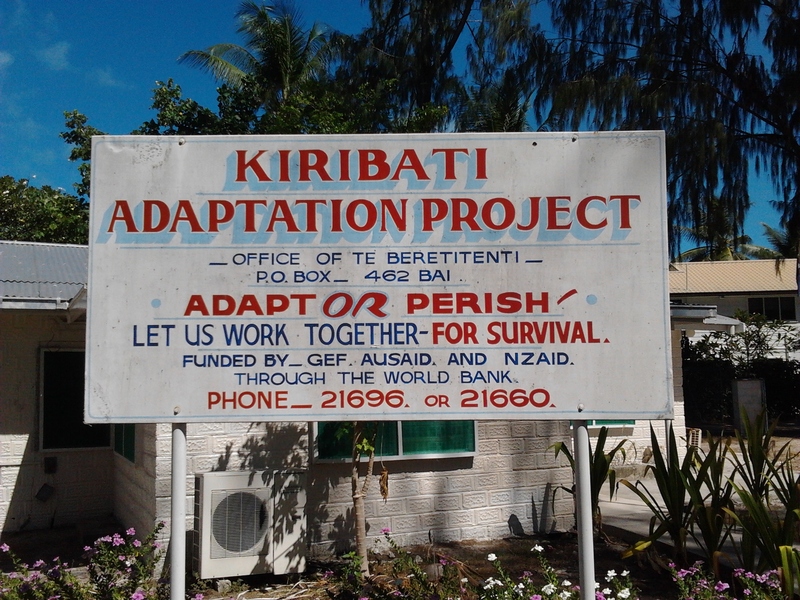 Kiribati is now in it third phase of the Kiribati Adaptation Program. 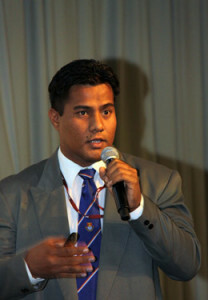 A government funded program, the Adaptation Program gives a realistic view on how the country is bracing for a change. The sea level has risen at an alarming rate over the last 30 or so years and through research and consultations that began in 2003 (Phase 1 of the KAP), Kiribati has had to think quickly and face a reality that most Western countries either think is too far away or will actually never happen. As a tiny country consisting of 32 atolls (a ring shaped island made up from coral), each island just sits on the water averaging about 3 metres above sea level. So with sea literally at the doorstep (or in many cases in the lounge room), Kiribati are needing to think quickly about their immediate future. The second big deal that is happening in Kiribati is that it has just published its first international author for climate change. Riibeta Abeta is a smart, eloquent and driven young man who is setting himself to be a voice for the next generation. 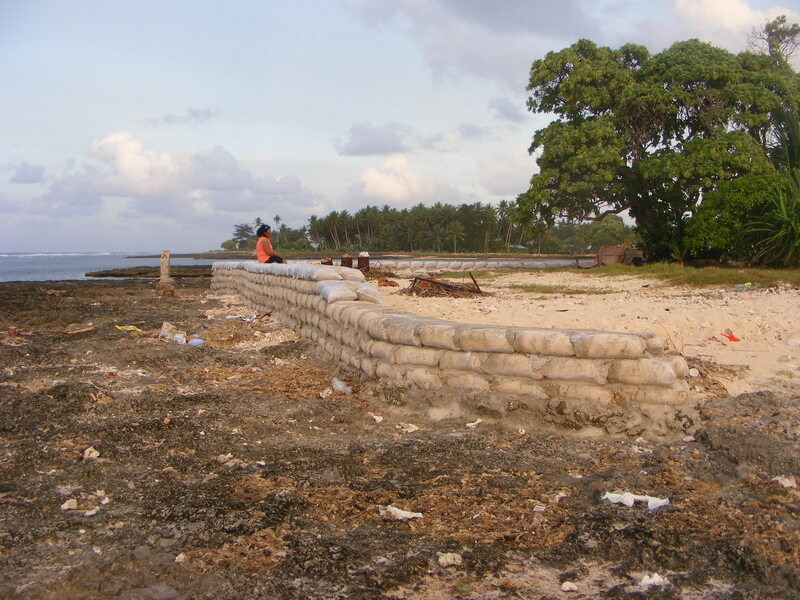 ‘Climate Change Adaptation and Coastal Zone of Kiribati’ published by the German based Lambert Publishing Company is the first publication on climate change from a single author from Kiribati. As most of you readers will know, Kiribati has been in the hot seat for the last couple of years, with the global community looking to see what what happens in Kiribati and how the country handles the effects of the ocean rise threatening their way of life. Keep an eye on Abeta, he is one to watch. 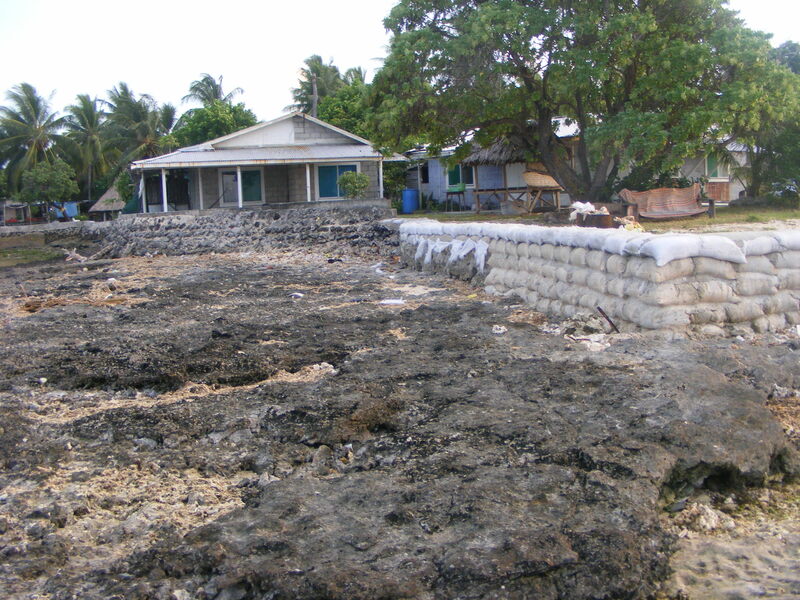 Finally, on a personal level here is the newest sea wall that my Mum has just finished building on our land in Kiribati. The water level has risen at a crazy rate in the last 30 years and from our family house on Tarawa we have been able to literally watch the water encroach on our doorstep. This wall has had to have been rebuilt and strengthened since the last sea wall had been become damaged due to the ocean hitting it so often. In this photo you can see the damage to the previous wall and the new wall that has been built. Now, if you’re still wondering how close the water gets, notice how close the sea wall is to our two houses over there. 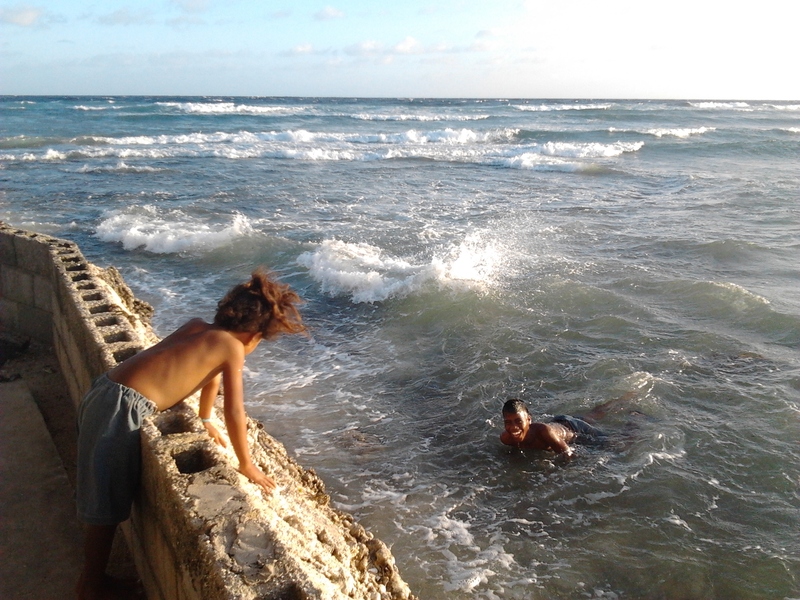 And now here is a picture I took of cousins playing in the water. Note that I took the picture standing on the sea wall. Now compare these photo’s to a picture of my Mum in 1982. 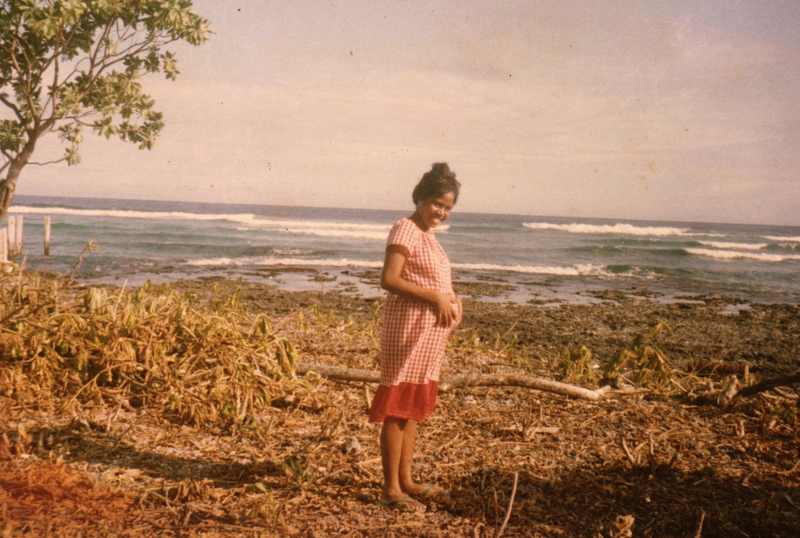 Pregnant, newly married and standing on the newly purchased block of land on Kiribati’ capital island – Tarawa. Taken at high tide water laps at the rocks behind her while she stands on the beach of her new home. No need for a sea wall. Nowhere near threatening to flood into the house. Have you seen Kiribati in the news about any of these topics? If you have heard about Kiribati in the news or heard anything else, I’d love to hear about it! As always, thanks for reading. It’s a pleasure to write for you all. Remember to sign up as an email follower and follow me on twitter on @thelittleisland as I am always putting links and sharing tid bits along the way. Interesting post as always Marita. It would be tempting to share your post to rebut the global warming deniers, but as the climate change denial lobby is driven by a blinkered, self-serving ideology I’m sure they would just ignore it. Meanwhile, a tragedy unfolds in the Pacific islands and elsewhere… that causes real pain and distress for people like the I-Kiribati. Thanks for your comment Nick. Yes, I might try and put the post out there in amongst the climate change debates but I too feel it would be ignored. I think I will try anyway! Thank you so much for putting the link for the article! I had come across it and for some reason thought I had read it but upon reading it again, I realised I had only seen the first 3 pages. A simple yet terrifying but a perfect description of where Kiribati is at the moment. It really does cover everything from open defecation, child prostitution to the country’s obsession with Spam. Even writing that now, my heart sinks. And yes here it is, with everyone wanting to know ‘what happens next’ like it’s a thriller movie rather than a reality of our globe. I could go on forever. Thanks for your comment Nick and for reading. If you have any more articles that are interesting, by all means, send them my way. Pingback: A Melting Iceberg Sinks More than the Titanic – INNOMINATE.